UNIDENTIFIED MALE 1 (voice-over): Mitt Romney's team is suggesting he could pick a running mate by the end of the week. PRESIDENT BARACK OBAMA (from campaign event): Governor Romney's experience has been investing in what were called pioneers of the business of outsourcing. STEPHEN COLBERT: Who cares? Pioneers opened up the West. Bain was just like the Donner Party. They ate the weak. It should be pointed out that just over a week earlier, Alex Budarin of the far left website Daily Kos likened all conservatives to the Donner Party in a July 8, 2012 post. 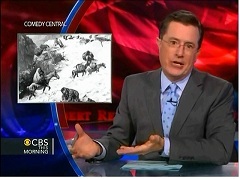 This isn't the first time Colbert has attacked anyone who is even a hair to the right of center. Back in March 2012, the Comedy Central personality blasted Rush Limbaugh, stating that the Taliban "evidently have a better track record on women's issues" than the conservative talk show host. Over a month later, he labeled disabled columnist Charles Krauthammer "Count Chocula."